The attraction opened in 1963 with awe-inspiring Audio-Animatronics and was an instant hit. The following is a short excerpt from Los Angeles resident historian Chris Nichols’ new book Walt Disney’s Disneyland, a meticulously researched and photo-rich visual history out today from Taschen. Hench knew how to reassure Walt; they would be realistic-looking mechanical birds—that sang songs. The Enchanted Tiki Room features more than 225 Audio-Animatronics performers, including drumming tiki statues and singing flowers. 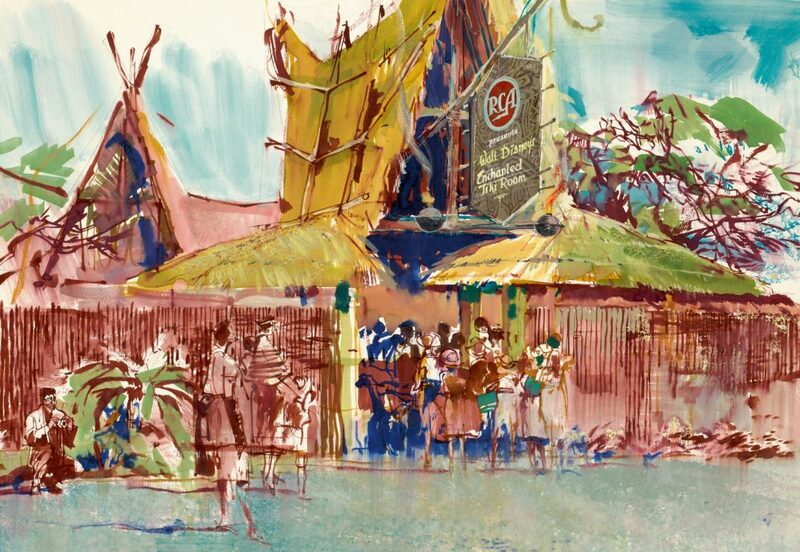 The room where guests “all warble like nightingales” and “tikis play the drums” was quickly changed from a restaurant to an attraction when it became clear that the show was so dynamic that no diner would ever choose to leave. Waiting visitors assembled in a forecourt for a preshow. 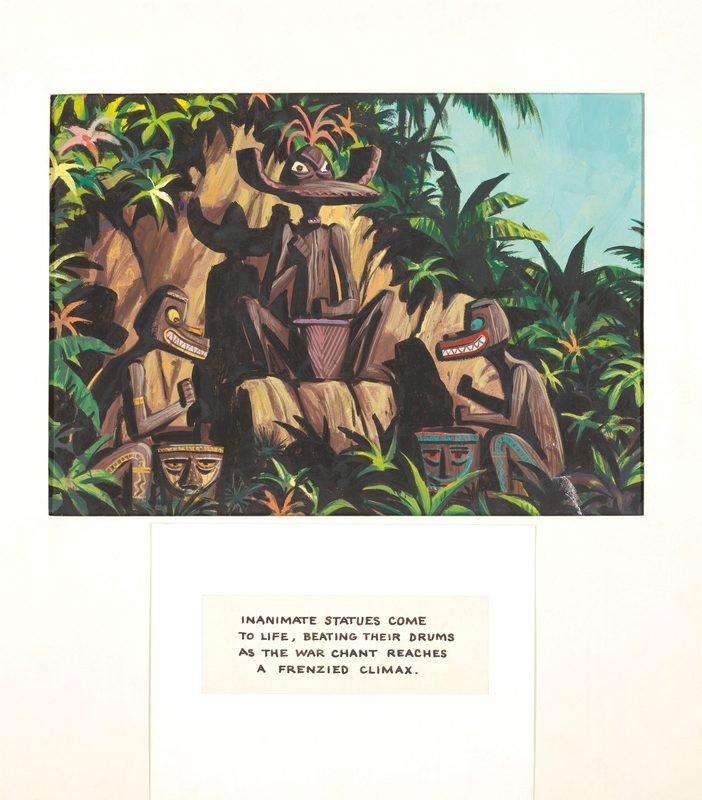 Walt assigned the design for this area to Crump who came across the book Voices on the Wind: Polynesian Myths and Chants written by missionary Katherine Luomala. He used this resource for his sketches of the gods, many of which were grounded on traditional island stories like that of Tangaroa, the Māori god of the sea from which all things were created, who proudly says “from my limbs let new life fall.” But a few of the concepts were just interesting ideas Crump was toying with. 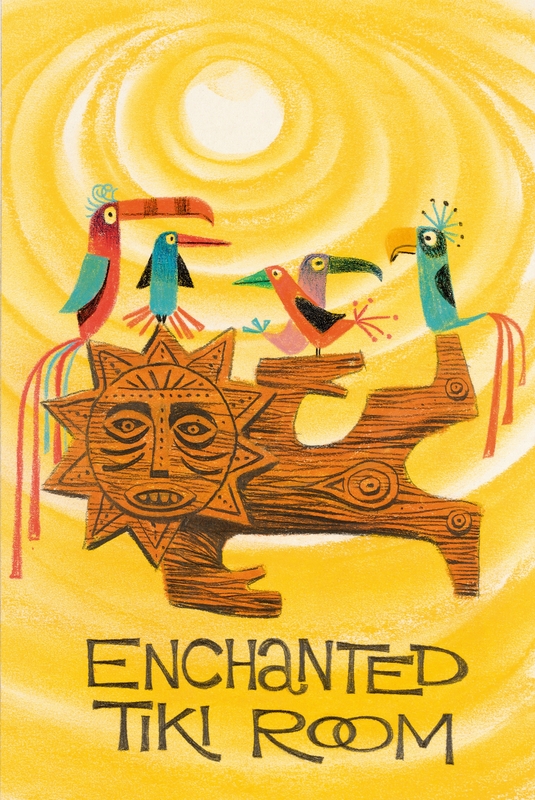 Artist Paul Hartley designed many fanciful Disneyland attraction posters during the ’50s and ’60s, including ones for Fantasyland’s Matterhorn Bobsleds, Tomorrowland’s Monorail, and proposed concepts for the Tiki Room. With head sculptor Blaine Gibson unavailable, Crump had to learn how to sculpt in the WED parking lot, which was hot enough to keep Plasticine malleable. “You know what I sculpted with? A plastic fork! One I got right out of the studio cafeteria,” he remembered. The preshow tikis were captivating, but the show inside had to be spectacular. Walt wanted 100 birds for the mobile that lowered from the ceiling above Hench’s fountain in the center of the room, but Crump had to cut it down to 30 to fit in the hidden mechanical equipment. He “put a little bit of Las Vegas on those girls,” dressing some of them in sequins. He also added sparkling reflectors to the eyes of the drummers so the vibrations of the drum would make them twinkle during the rainstorm, an effect created by Yale Gracey with thin strips of Mylar hidden behind bamboo. When Imagineers attempted to replicate a rainstorm using real water at Walt Disney World in Florida nearly a decade later, they discovered it didn’t look as good as the Mylar, so they replaced their rain-making system with the original technique used at Disneyland. Previous articleWhere to Get the Best Milkshakes in L.A.
Next articleHow Proper Urban Planning Can Cure What Ails L.A.